Climb the three highest peaks in Yorkshire in under 12 hours. This is a wonderful opportunity to hike the Yorkshire Three Peaks as part of a small group on Saturday 18th May. It is a fully guided day event for a total cost of £75 per person and includes guiding by professional Mountain Leaders in small groups and celebratory meal at the end of the hike. We also have a support vehicle for water stops, refreshments and spare clothes at two locations on the route. There are 8 day event places, plus we will be joined by 18 people staying at the bunk barn. So you will be part of a group of about 26 in total, some of whom will be day hikers and some will be booked at the bunk barn for the weekend. We will all eat together at the end of the challenge, to celebrate our achievement. For this Yorkshire Three Peaks day challenge on Saturday 18th May, 2019, we will be starting and finishing from the Broadrake Bunk Barn where we are based for our all inclusive weekend option. The Barn is on the route, close to Chapel-le-dale and provides a great base for meeting up, food and relaxing after the challenge. There are 8 places available as a Three Peaks day event, plus there will be 18 people staying at the bunk barn also on the hike. The reason for this is that we have just found that some people prefer to find their own accommodation and some prefer to book as a package. So please be aware that you will be part of a group of about 26 in total, some of whom will be day hikers and some will be booked at the bunk barn for the weekend. We will have two leaders, so we are likely to split the group into two at some point, to make smaller more manageable groups. The Yorkshire Three Peaks Day Challenge takes on the peaks of Pen-y-ghent(694m), Whernside (736m) and Ingleborough (723m), in under 12 hours. These peaks form part of the Pennine range, and encircle the head of the valley of the River Ribble, in the Yorkshire Dales National Park. This is actually the original Three Peaks challenge. The Yorkshire Three Peaks day route is 24-miles long, and includes 5,200ft (1,585m) of ascent, there is no driving involved between the peaks and the aim is to complete the challenge in under 12 hours so walking in the daylight. This is a fully supported Yorkshire Three Peaks Day Event with a support vehicle providing tea/coffee/water and where you can store extra food/clothing etc so you do not need to carry everything. We will also have two small groups each with a leader so you can be more closely matched in hiking speed with others, all this means maximising your chances of completing the challenge in 12 hours. Total cost is £75 per person. This includes guiding by professional Mountain Leaders in small groups, plus a support vehicle for water stops and refreshments at two locations on the route, plus evening meal on Saturday to relax and celebrate your achievement with your fellow hikers. We will start the challenge at 7:30 am, so you need to arrive around 7:00 to get parked and ready to set off. For the challenge itself you will need to provide your own packed lunch and bring your own favourite hill snacks and energy bars to supplement this. We have also set up a Facebook Event Page so that anyone thinking about joining us, or who has already signed up, can share information about travel and/or car share plans. We will also be posting regular updates and information about what to expect and how to prepare for the day on the Facebook Event Page. In June we completed the Y3P on one of the worst days of the year. We are proud to say that the whole group completed the challenge in some truly awful weather and you can read about it here. The walk is a very attractive and fun day out. Yes it is really!! The hills are all different in character and offer great views of the other mountains and valleys below. 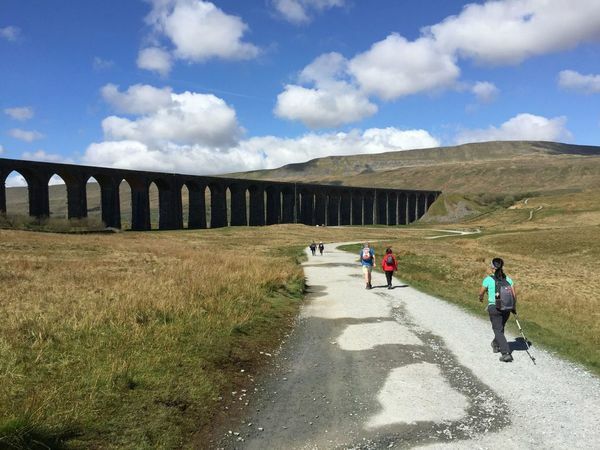 The hiking between each mountain is also full of interest, including picturesque Yorkshire villages and the great Ribblehead viaduct. We will in effect break the walk into three sections, with a support vehicle about 1/3 of the way at Horton and then at a further 1/3 at Ribblehead before the final climb up Whernside. Our route will take on the peaks in this order : Ingleborough (2nd highest), then Pen-Y-Ghent (the smallest but steepest of the three) and then finally Whernside (the highest, but the easiest ascent). By taking this route we also avoid all the crowds that leave Horton, the traditional start route early in the morning. As this is a day event only option, you need to find your own accommodation and then join us before the start at 7:00. There is Bed & Breakfast and also hostel accommodation in Horton and also in other villages nearby. We would recommend booking your accommodation as early as possible as things often get booked up well in advance. Accommodation is not included in the day option, but an evening meal at the Broadrake Bunk Barn with the rest of the group, to celebrate after completing the challenge is included. So you can relax with a meal and a drink at the end of the day. There is a Facebook Event Page, so that anyone thinking about joining us, or who has already signed up, can share information about travel plans and maybe looking for car sharing. We will also be posting regular updates and information about what to expect and how to prepare for the challenge. Mountain Hikes 3 peaks Facebook Event Page Link. To book, click add to basket and then checkout to pay by the total by paypal to confirm your place. If you cancel in advance of the event, a refund will only be made if the place is re-filled. Professional Mountain leaders to guide you, small group size, water/tea/coffee at each stop, support vehicle. Evening meal at the end of the challenge. Lunch, snacks, train or car travel, or accommodation. Our start is from the Broadrake Bunk Barn near to Chapel-le-Dale. You will need to make your own way to the start and your own arrangements for return at the end of the day. If you are driving and would like to car share, or offer a lift, or looking for a lift you can post through the Facebook Event Page.